Photographer Mark Maziarz - Interviewed!! Back in December I totally blogged about the 2017 APA Awards and promised an interview with Mark Maziarz. Maziarz won in the corporate category with a gauzy dreamy strange portrait that seemed too beautiful to be placed on the same shelf as high school senior wallet-size-prints and JC Penneys churn-and-burn type 8x10s. He said he'd respond to my questions but he was busy. Then came the holidays. Then came the cold long winter and finally we reconnected and created the thoughtful goods. (Ian Tuttle): How long have you been making a living with your photography? Mark Maziarz: I got my business license in the fall of 1990, so it's been almost 28 years now. Wow. It doesn't really seem like I've spent more than half my life in photography, but that might be because my work is constantly evolving. I tend to shoot the things that I'm most interested in at any given point in my life. 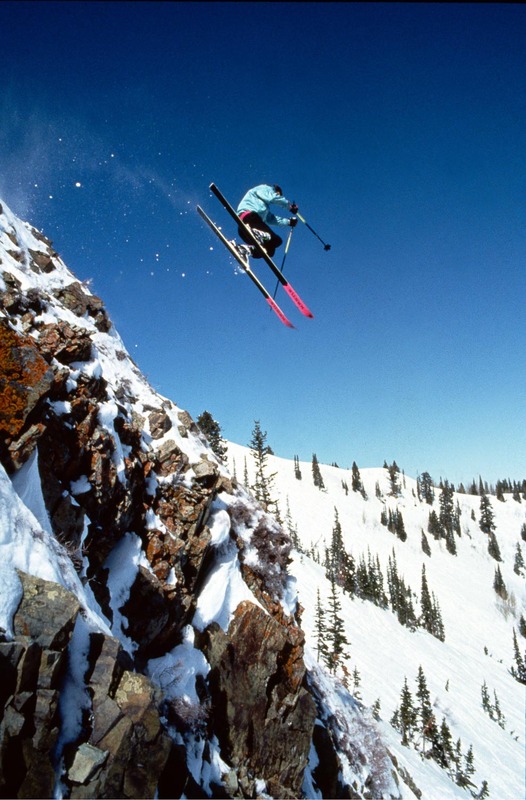 For example, when I first moved to town, my friends and I skied a lot (106 days my first year in Park City) and some of them loved to throw themselves off big cliffs. I was always there with my camera. After the extreme sports phase, I started to appreciate how beautiful the town of Park City is and I spent most of my time shooting local scenes and streetscapes. The last few years, as we raise our kids, I've grown to appreciate the value of people, their stories and relationships. That's when I came up with this style of portraits. One of my favorite aspects of getting these portraits is hanging out with the subjects and getting to know them a little bit. The camera gives me license to ask questions that I probably wouldn't ask in ordinary circumstances. What is the most recent personal project you’ve finished that you are proud of? I like when there is a blurry line between personal and paid projects. The Sundance One Minute Portrait Series started out as a personal project, and then morphed into a real job with a local TV station. The project got its name from the reality of the packed schedules that the Sundance Film Festival filmmakers, crew, subjects and cast have during the 10 days of the festival. If I have a full minute to photograph someone, I usually consider myself lucky. A lot of times, I only get 20-30 seconds to greet them, tell them what I'm doing, pose them and get the image. Spike Lee took a particular interest in the camera and the process, and we talked for a few minutes, which was nice. He wanted a print, so he wrote down his address on a piece of paper for me. Later that day, when I copied his address, I flipped over the sheet to see that it was his publicity schedule for the day. It was non-stop, back to back interviews and appearances for the movie he was producing. All day, every day for about 4 or 5 days in a row. I think there was something like 70 or 80 appointments on the schedule. Realizing how hard all these people worked to promote their films made me want to do something unusual and different when I made their portraits. Technically, I don't think the project is finished yet, but it is evolving. Do you photograph every day? I don't. And I struggle with this a bit. One reason is that Jay Maisel, whose work, personality and style I'm a big fan of, insists on carrying a camera almost everywhere he goes. He says photographers should be constantly shooting. I like the idea of shooting everyday, but I also think of the act of photography as being a bit sacred and I don't want to do it just to do it. Back in the film days, people used to be a bit more deliberate in what they shot, and I miss that a little bit. I have a lot of crap to wade through in all the digital files I've shot over the years. What would you tell your past self on year one of starting your photography business? That's a tough one. I feel like I've had a pretty good run, so I don't want to mess with the formula too much. Photography has got me to the places I wanted to go (literally and figuratively) and I'm thankful for that. There are some adages that apply to life like "don't sweat the small stuff" that I think will mess with a successful photography career. Clients like to see you pay attention to small details and very often a tiny gesture will make a photo. A slight turn of the hand or a slight facial expression can make or break an image. What would you tell your future self ten years from now about running your photography business? Did I spend too much time on preparing stock files for distribution in the 2010s? A big part of my career was stock photography in the 90s and early 2000s. Then the growth of microstock in the mid-2000s and the recession in 2008 combined to make stock photography an impractical way to make a good living. Your images are “soft.” Why? How did this look evolve? Where did it come from? I did a fine art show called "geolines" in 2012-2013. It was abstract photography that studied how much digital information is needed to still evoke an emotion in a photograph. The geolines photographs are bands of color and tone that are based on photographs that are as little as .01 megapixels. That show was a response to the precision and ever-increasing megapixel counts of digital cameras. I felt like digital cameras had become too perfect with an almost hyper-realistic sense of reality, so I responded by seeing how lo res and imperfect I could make a photograph be. But I missed photographing people and I started thinking about imprecision and softness in portraiture. I've always liked the look of Matthew Brady-era portraits, so I found an old Civil War lens on ebay and built a camera around it that allows me get a short depth of field look, but output a digital file. Do you experience doubt in your work? Oh hell yeah. I think it's part of being an artist. In life and work, I think we need the lows to truly appreciate the highs. Life would be boring otherwise, wouldn't it? I've recently started a personal project of portraits of artists in the Park City area. I'm combining the portraits with interviews and one of my key questions is how does confidence affect their work. I'm learning some interesting ideas. For about 14 years, we lived in a part of Park City that was a fringe neighborhood surrounded by open space and filled with huge spruce, fir and aspen trees. It was quiet and quirky and we loved it. Because the neighborhood was so steep, our garage was down at the street a bit separated from the house. Soon after we moved in, I came up with the idea that I could turn that upper level of the garage into a sweet office, so I dropped the upper level floor and added a big dormer and gave myself one of the coolest work spaces I've ever seen. It was heavenly. All I could see out the windows was the forest and sky. I even had a bear greet me on the deck one morning. It was about a 15 second commute from our front door, but the physical separation from the home was everything. A few years ago, we moved into a new house in an adjacent neighborhood that is way better in every way, except I now work in the house and no longer have my sweet carriage house office. It's not a great situation, so I have a number of ideas saved so I can design my new workspace in the woods. Name three people who continue to help you along your way. What do these people do to help? My wife Mary Beth is a performing songwriter. We're in apparently completely different businesses, but there are many similarities between music and photography. Hiring, licensing, copyright infringement, motivation, creation and more. We get to help each other out, while maintaining a fresh perspective. Invaluable. My parents live 1200 miles away and have had way different careers. They're my life coaches -- offering great insight and tips on how to hand handle life, including the work/life balance. The third spot is filled in by various photographers depending on what type of photography I'm concentrating on. Lori Peek is a local photographer who has done wonderful work in the active lifestyle category and she's helped me, particularly in the early years of my career. I've also taken a few workshops with Jay Maisel and got to know him over the years. I love his concepts of light, color and gesture. Thank you Mark for your time and insight! Mark's winning portrait from the APA Awards gallery. Last fall I had the pleasure of meeting and photographing Sue Taylor for a feature in Cannabis Now Magazine. Sue was a gracious and warm subject. Thanks to photo editor Gracie Malley for the assignment, and also for enough lead time to allow me to shoot on film. The black and white portraits were made with my Speed Graphic 4x5. Ian Tuttle photographs Bill Nye with a 4x5 Speed Graphic in San Francisco. I interviewed Shane Tobin at Spotify about the impression headshots make on him when he's considering a company for a partnership deal. Shane was Vice President of Business Development at The Echo Nest prior to its acquisition by Spotify in March 2014. Before that, he directed business development at MobiTV. I was rocking out to some Hesitation Marks streaming through [now defunct] Grooveshark when Shane walked into my studio for some headshots last week. He glanced over at the computer and said "Hey! That's not Spotify!" Busted! I got a lesson in royalty payments and how Spotify actually pays musicians while the service I was using doesn't. I've since made the switch and am now listening in style! I always like to know how professional headshots are viewed in their native environment...particularly on company websites and Linkedin profiles, and Shane was a great person to ask about this. Younger companies can get away with less polished head shots. As a company matures, so too should its visual presentation. Employees feel valued when their company presents them professionally on their website with high-quality head shots. Even though we're all impressed that you spoke at your local Ted conference, your headshot should never show you wearing a headset microphone. Keep your photos up to date. It sends a bad message when your head shots aren't current. Ian Tuttle: What is your current role at Spotify? Shane Tobin: I joined the Business Development team handling software partnerships at Spotify last year after the music intelligence company I had been at for 3 years, The Echo Nest was acquired. How many prospective companies do you look at in a typical month? It ranges, but probably around 10-20 a month. We’re pretty focused on specific partnerships but I always want to keep informed on new start ups that are gaining traction or breaking new ground in the music and social space. What is the FIRST thing you look for? I look at the presentation of the website, what they see as their primary value proposition, how they summarize their business offering and then if I know of anyone on their team, board or advisers. Can a company’s photos of their employees affect their desirability as a partner, either negatively or positively? I think if you are an early startup you get a lot of passes in terms of how you present yourself but as you get larger or get older, you need to be more professional. If you have a uniform look for your team photos, it shows you put some effort in. I think it also makes employees feel like they are valuable too when they see themselves on their site in a professional manner. Any specific cases you can think of with a particularly bad photo? Using a photo from a conference when you have a mic attached is the worst. Or you are on a stage talking with your hands. Ted talk photos. And no selfies from your laptop. What about a particularly good one? Just be natural, dress nicely, be yourself and approachable. What sort of photos would you consider "unacceptable" in a business context? Being too casual, using photos of someone else like a celebrity, or a photo that has other people in it. What about eye contact in a picture? Yes, don’t look away. What are you looking at? Did you see Bigfoot driving a truck? If so, that’s awesome but take another photo where you are looking into the camera. Do you notice what someone is wearing in his or her picture? Only if they are wearing something unprofessional or out of context like a tuxedo. Okay, but really, does a photo actually matter? Most of the time if you haven’t met a person, this will be your first impression either on LinkedIn, doing a Google image search or on your website. So I think it’s worth it to take the time and do it right. Do you notice the background in a photo? Or the context? Is a plain backdrop or outdoors or something else particularly good or bad? We don’t need action shots of you in the forest or leaning against a car. Have you ever met people from a company and they look completely different than their pictures? Did it matter? Yes, because a lot of people don’t keep the photos updated. Sometimes they just want to be seen as younger. But styles change and in a lot of cases, the photos look dated and people will pick up on that. Do you have any favorite head shot stories of all time? A friend of mine had a bright light shinning behind his head that made him look like a data god but I told him he need to take it down. It looked like the cover of a self help book. My goal is to provide the best headshot you’ve ever seen. It’s a tall order, and my success depends not just on technical knowledge of camera equipment, lighting, and body language, but also on the context in which a headshot is used. To that end, I am always looking for expert knowledge and guidance. I recently took professional headshots for Devin Brooks, who works at Salesforce, and asked if I could interview her about what she sees when she’s going through applications. Ms Brooks is an Inbound Candidate Sourcer. She processes around 200 applications every week and looks for appropriately talented individuals to fill specific sales roles. Ian Tuttle: What is the first thing you look for in a candidate? Devin Brooks: My roles require a very specific skillset and number of years of experience, so first and foremost, I look for amount of experience a candidate has in the industry, and then review the specific experience to see how relevant their sales experience is to the roles for which we are hiring. IT: How often do you see a picture of a potential recruit? DB: For international candidates (I hire in Brazil and Mexico City as well as the US and Canada), it is very common for candidates to include a headshot on their resume. Otherwise, I don’t necessarily see a photo unless I am on the fence, and may go digging for more information on LinkedIn. IT: How can a person’s picture affect their desirability as an applicant/recruit, either negatively or positively? DB: A photo is our first glimpse into whether or not you might be a culture fit at our company. While it may not be a hard yes or no from the picture alone, it could raise a flag. It also really depends on what types of roles one might be hiring for as well. In my previous role, as a Recruiting Coordinator at a staffing agency, wherein all of our time was spent on LinkedIn, the picture was much more important. We were hiring for roles where companies asked for very polished individuals, typically in the Administrative Assistant and Executive Assistant space. If someone couldn’t demonstrate that in their photo, it was easy to pass on those folks. If you are in the market for a particular role, you must know your audience. IT: What sort of photos would you consider “unacceptable” in a business context? IT: What sort of photos actually help? DB: I think the team would agree that a photo that shows a bit of your personality, through a smile or the background, is appreciated, and helps us to see you more as a human than just another candidate. DB: I think a smile is great! We are a fun company, and we like our employees to be the same. IT: Do you notice what someone is wearing in his/her picture? IT: Okay, but really, does a photo actually matter? DB: Will it make or break you, if you are an otherwise quality candidate? No. But don’t give us an opportunity to even lean in the wrong direction and have any doubts. IT: What do you think of your new headshot? DB: Interestingly, the people who have noticed my new headshot most have been my coworkers…At Salesforce, we utilize a company-wide social media channel within our company called Chatter. It is essentially the Facebook of our company, but we use it to communicate on a variety of issues, with customers and co-workers alike. So, much like Facebook, we have a profile and a picture and that picture is shared with anyone who looks me up. Since I deal heavily with employee referrals, I have employees all over the globe looking me up and reaching out to me. Having a professional headshot to share internally has been fantastic – it is a photo I am proud of, and I think sets a great tone for me when people see it and choose to reach out. I feel like I look like me, personable and accessible and here to help, but also professional. So I have loved the new pic big time. DB: Think about the value of a fantastic photo even when you are happy in your work environment…how many people look at your photo just before they call you or reach out for a meeting. It is a valuable first impression. And from a hiring perspective, it will always depend on what type of role it is that weighs most on your photo’s first impression. Give us a hint of who you are while keeping it professional and ALWAYS ALWAYS ALWAYS have a photo. No photo is even worse than selfies. If you know your ideal role requires an extra polished exterior and a lot of customer service and smiles, then step it up with your photo and really make it count! Coaching facial expressions as a portrait photographer is a tricky task. In day-to-day life you don't consciously manipulate your face muscles the same way you do, say, your legs or fingers (unless you're a mime or a politician). Your outward expressions are the visible reactions to what is going on in your brain. When you try to fake an expression it usually results in a terrible portrait. Prof Paul Eckman (University of California), is the godfather of our understanding of expressions. In the 1960's he built on the work conducted by Guillaume-Benjamin-Amand Duchenne (shown above performing facial electrostimulus) a century earlier and determined that the difference between a real smile and a fake smile is rooted in the signal generation in the brain; that is, totally different parts of the brain are responsible for creating real and fake smiles. It all comes down to muscle control. You can consciously trigger the zygomaticus major, which creates a "fake" smile. But it's really tricky to tense your orbicularis oculi, which automatically contract during a "real" smile! Famed portrait photographer Peter Hurley figured this out after photographing faces for decades and teaches "squinching" to look cool when you're getting your portrait taken (Watch it! Please!!). Basically, squinching all comes down to--you guessed it--flexing the orbicularis oculi! And then there's another little muscle problem... According to body language expert Vanessa Van Edwards, the zygomaticus minor is the critical muscle in a "real" smile. While it's easy to consciously flex the zygomatic major, and you can work your orbicularis oculi if you really try, the zygomaticus minor isn't as responsive to conscious control. In fact, only 1 in 10 people is capable of moving it at will! PS: I always heard that it takes more muscles to frown than to smile. ("Smile! It's less work!"). In fact, a genuine smile uses 12 muscles. A frown... only 11! If you want to know specifically which muscles are put to the task, read this rundown by plastic surgeon David H. Song, MD.